Above: Devon Sandoval of NM United. Photograph by Kate Russell. THE FRONT OFFICES OF NM UNITED in downtown Albuquerque feel like a very puro New Mexico project. Owner Peter Trevisiani is from Santa Fe. 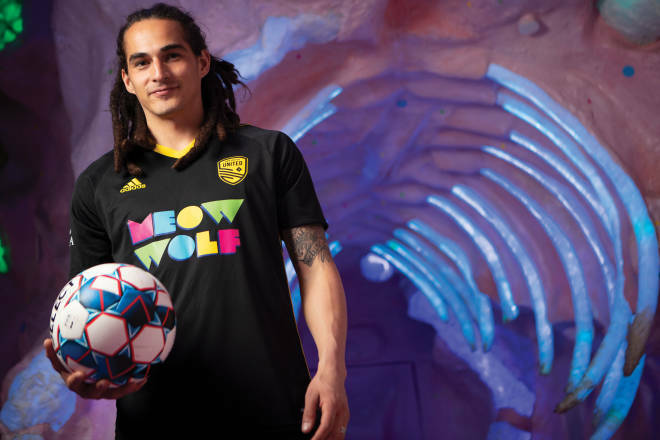 Their jersey sponsor is Meow Wolf. The NM United flag includes every town in the state—from Wagon Mound to Hope. But that spirit is best represented in the team’s first signing—that of beloved local striker Devon Sandoval. Born and raised in Albuquerque, Sandoval played for Eldorado High School; in three seasons at the University of New Mexico, he tallied 26 goals and 17 assists. In 2013, Real Salt Lake, of Major League Soccer, drafted him in the second round. He went on to start a game in the Western Conference Finals that season, scoring a goal against the Portland Timbers. He played for RSL for three years, then traveled with MSL reserve teams—most recently Atlanta United 2. In June 2018, Sandoval became the first person to sign with the newly formed NM United, of the United Soccer League. As we spoke, his eight-month-old daughter waved to her dreadlocked father through the glass of an adjacent room. For Sandoval, his family, the team, and the town, it feels good to be home. Every day I get to come home to that face. It’s pretty special. That’s what it’s all about. This is something I’ve dreamt of since I was a kid. My friends and I would talk about it—man, there should be a professional soccer team. For kids growing up, they’re going to see, maybe it’s not that far, maybe I can do this. I’m here to win games. I’m not just here to be on the poster. I want to give people here in New Mexico something to be proud of and get behind, because I really think it could be something special. I learned so much at Real Salt Lake. What it takes to be a good professional, what it takes to take care of your body. The biggest thing I’ve taken away from Salt Lake are the people and how important it is to have the right people in the locker room and a good culture. If you don’t have good culture, if you have a few bad seeds, it’s like a cancer. They bring the team down and it’s going to affect the product on the field. But if you have that culture where people are willing to fight for one another, do everything they can to win, it’s infectious, and the possibilities are endless. There’s a big emphasis here on bringing in the right people. I believe in God. I believe I’m here for a reason. It’s crazy for me that the year this is coming together is the year that we had a daughter, and it’s kind of like a reset button. The opportunity to be a part of something brand new in my hometown is something I couldn’t pass up, especially right now, where we are in life. When I left, I was 21—to come back as an adult, with a family, I want to see the city in a different way, and what the state has to offer. It’s a beautiful state with so much history. I want to take it all in while I’m here. This city, this state shaped me into the person I am today. It’s easy to lose sight of that, so to be back here gives me the opportunity to take everything in that made me who I am. When I want to get out, I’ll go fly-fishing.​ It’s just nice being out in nature. You’re around beautiful surroundings—the river, mountains. Fish for me are just the bonus. If I don’t catch something, I don’t really care. It’s my happy place. It’s really easy to get caught up with technology and the fast pace, and for me when I go out to the river, things just slow down and I’m just in the moment. That’s something I try to take into my everyday life. It’s important to me that my daughter sees me playing and can remember it, because I want her to grow up knowing that whatever she wants to do in life, she can do it if she’s willing to work hard. I want her to grow up seeing that. NM United hosts home games through October at Isotopes Park, in Albuquerque.